Over a year after their Southern neighbors, Canadians are finally getting their hands on the magical iPhone. But Rogers Communications, the only carrier with a contract to sell the phone, has a data plan that makes AT&T look positively philanthropic. A $75 a month plan comes with a mandatory 3-year contract, 100 text messages, 300 weekday minutes, and a 750MB cap on 3G usage. 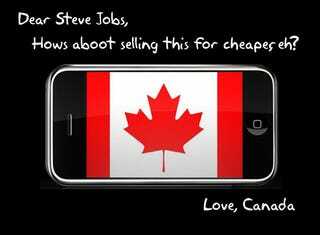 To combat this injustice, Canadians have appealed to the top dog himself, Steve Jobs, in a letter asking him to intervene on their behalf. The letter, which can be found on ruinediphone.com asks Apple's head honcho to "take a look at all these disappointed people" and do something! It also includes a petition, which has garnered over 10,600 signatures at last count. Do our friends to the North a favor and sign the fracking thing, eh?